The FMD20 is particularly suitable for heavy-duty workloads. 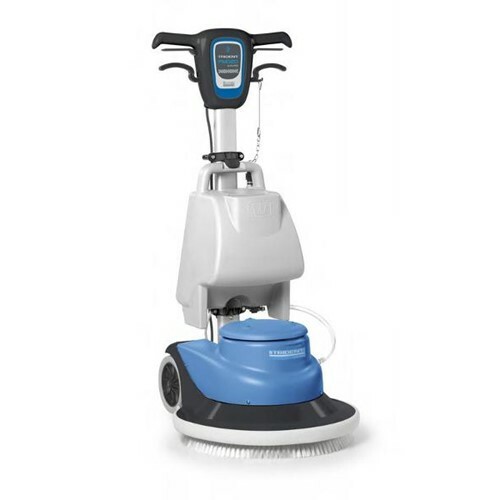 The brush head unit is made of steel and combines a high-powered motor with compact size. It is a single disc machine, robust and easy to maintain. With a stainless steel frame and PPL coating, it combines efficiency and versatility together with modern ergonomics. The FMD20 is equipped with a new nylon gear box for long life, high reliability and quiet operation. The removable power cable makes transport and maintenance easier. Safety system requires machine activation by simultaneous pressure of the handlebar levers and button. When the levers are released the FMD20 stops. Easy-to-remove solution tank simplifies refills and clean-up.